The photo id for this photograph is 47, in the Trains and Railway Lines album. This photograph is undated, but believed to have been taken in the 1930s, and shows a bit of an accident on the bridge over the Goyt, looking from Tom Brad's Croft towards Whaley Incline. It looks like the wagon had not been properly fastened onto the haulage chains of the incline. 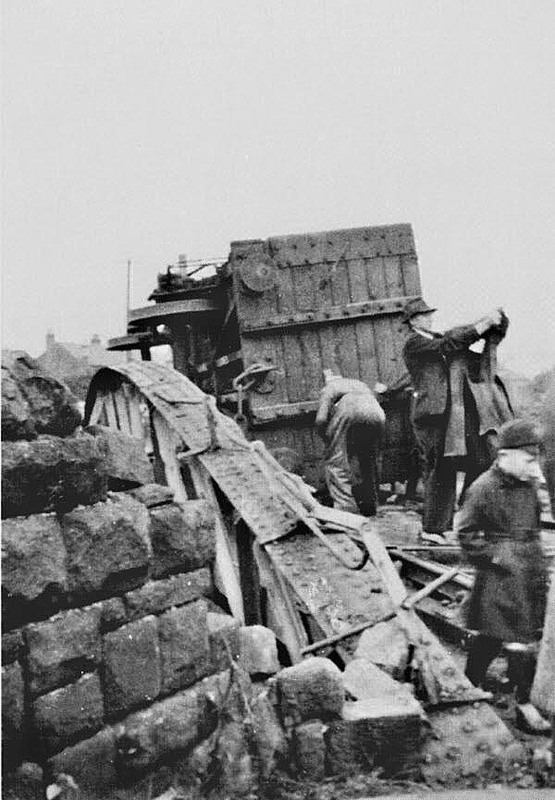 This was the result of the steel chain breaking on the incline at Whaley Bridge.The two coal- laden trucks (going down the incline) ran away fairly near the bottom of the slope and turned over on the bridge spilling their loads of coal into the River Goyt. Local residents had plenty of fuel for their fires for the next few weeks! !